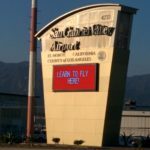 AACIT’s airplanes are based at the San Gabriel Valley Airport (formerly know as El Monte Airport) in the city of El Monte, California. The identifier for the airport is EMT. Easy links for directions by car, or for exploring the aviation charts around EMT can be found below.